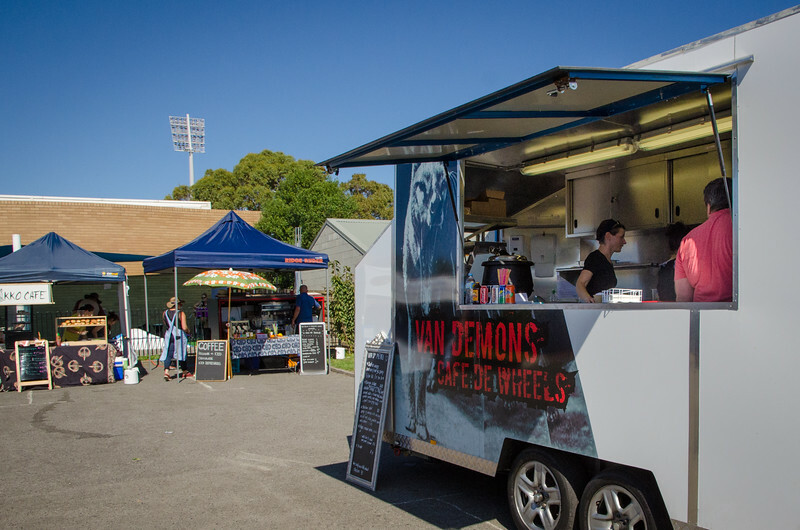 EDIT (May 2016): It’s been just over a year since we first tried the burgers and hot wings from Van Demons Cafe de Wheels. Since then our paths have crossed numerous times and we’ve actually become good friends! Looking back at some of the photos below it’s pretty clear how Dave and the team have developed, improved and adapted to the fast-changing food truck scene in that time. The consistency in their food is now at a really high level and it’s great to see that they aren’t afraid to incorporate feedback from their customers into their menu. I can’t believe I missed one of their special release ‘baconator’ burgers!! Interestingly, a few months ago Dave and the team introduced a cheese burger to their repertoire. How could I say no? Unfortunately I was at work and didn’t have my SLR on me, so a crappy iPhone photo will have to do. Trust me, it doesn’t do the burger justice! This cheese burger is as old school as you can get, and I’d hazard a guess it wouldn’t be at all out of place in the good ol’ US of A! Finger thin beef patty, a square of smooth cheese draped and melted on top, tomato sauce, a squirt of sweet mustard and a couple of tangy pickles between two halves of a pillow soft brioche bun. The perfect little semi-hunger buster! Substantial enough to get you through the day, yet not so big that it will spoil your dinner. The patty is well seasoned and the traditional combination works just like it should, with all elements fairly balanced and nicely restrained. Personally, I probably would have preferred a slightly large patty and I also didn’t find the bun to be the best selection, being extremely soft and lacking substance. This is one of those instances though where personal preference comes into play, as I’m sure that to many this style of bun would be simply perfect. If I had the choice I’d probably order another dozen of those dastardly delicious and supremely spicy hot wings, but at the same time if all you need is a no-frills burger chock full of quality, then the cheese burger from Van Demons Cafe de Wheels is going to be right up your alley! If the well known and (excessively?) 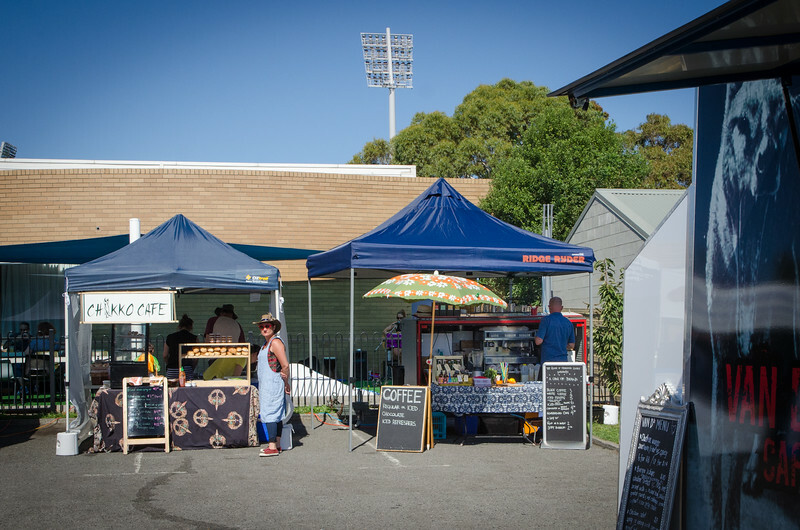 well attended Twilight and Farm Gate markets are feeling a little passé, then The Hive market could be just the thing you’re looking for! With the catch cry “…a hub for the hand made”, The Hive market has been ticking along nicely behind the scenes since September 2013. Jewellery, clothing, home made beauty products, toys, knitted goods and garden ornaments are just a few of the many items available for purchase from the dozens of stall holders inside the Clarence PCYC on Scott Street. While many of their wares weren’t up our post-modern alley, a return visit may be in order to have a closer look at the cacti and succulents on offer…I reckon one of those would look great in our bathroom! More importantly though, in recent times The Hive has taken advantage of Hobart’s exploding food truck scene (the scene, not the trucks…) and has expanded its food and beverage options from plain old sweets and coffee to include options such as Vietnamese cuisine from Chikko Cafe (click here for my review of Chikko), pizzas by The Wood-Fiery Redhead, wines from Darlington Vineyard (tastings available! 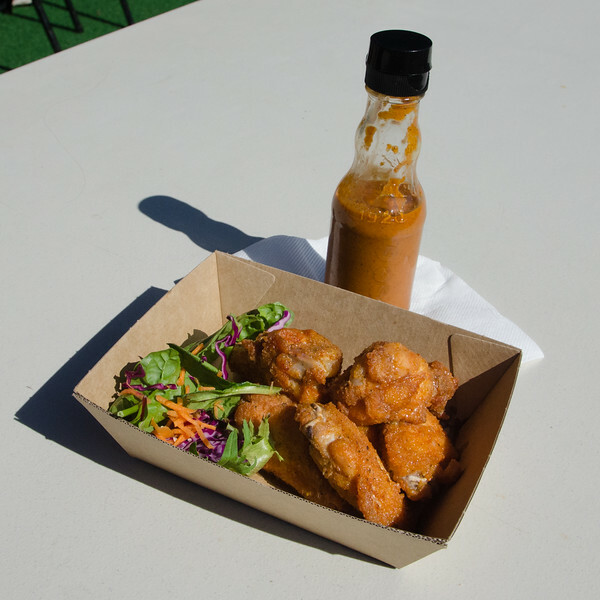 ), caramel stroopwafels from Wafflicious and best of all, burgers and chicken wings from Van Demons Cafe de Wheels!! VDCdW have only been around since early January this year, but in that time they’ve built up a small but loyal following through word of mouth, a savvy online presence and a commendable willingness to support numerous local markets and social gatherings around the Hobart area. Of course, all it took was one glimpse of a Facebook photo of one of their beef burgers to pique my interest! 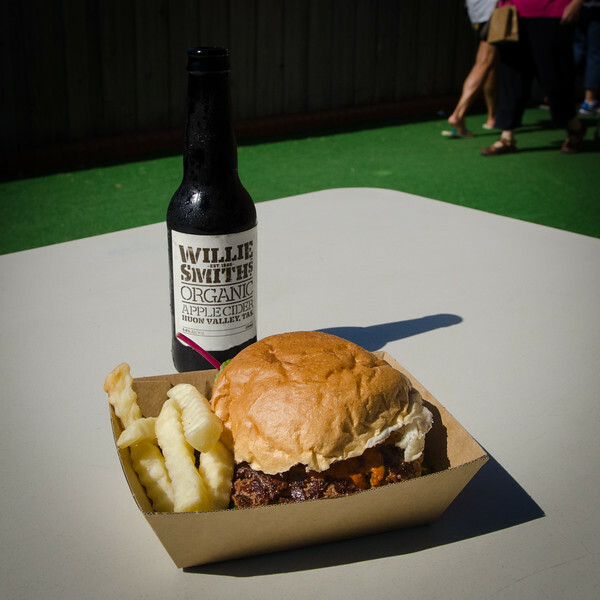 Now this isn’t any old beef burger, and for that reason it wouldn’t be fair on either them or the other burgers we’ve tried around Tasmania to include it in the official Two Clowns Burger Challenge. While the 200g beef patty will be familiar, the inclusion of grated carrot, red cabbage, Greek yoghurt, mixed leaf salad and their very own home made spicy sauce makes for a very unique burger experience! While it’s impossible to beat a good ol’ cheeseburger, I really did enjoy this creation from the VDCdW crew, with the sweetness of the carrot and the sourness of the yoghurt blending nicely, while the cabbage added some much needed crunch. The best bit of all though was their punchy little hot sauce that got the tastebuds dancing and brought a slight sheen to my brow on what was already a very warm summer’s day. The Willie Smith cider clearly went down a treat! 12 months ago, Karen and I would have stood up and completed the short walk along the driveway to the main road without incident. However, on this particular occasion we had only taken a few steps when from left-field we heard a random gentleman calling out my name and offering a farewell. Huh? 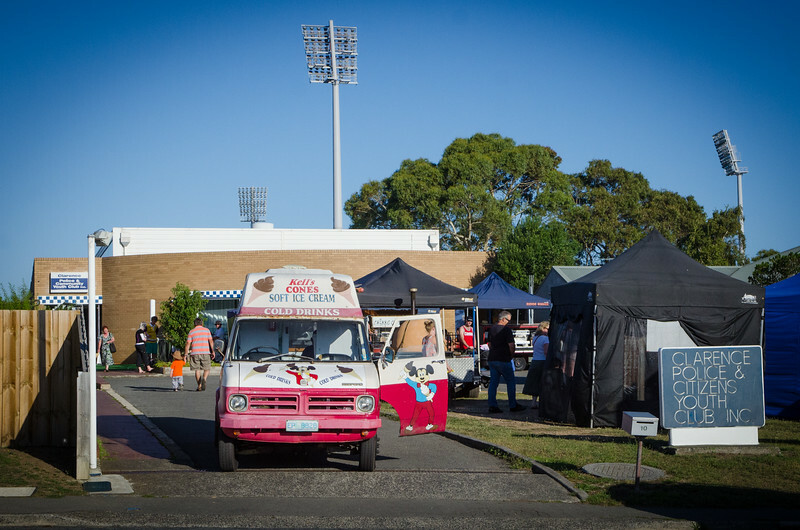 A quick head-turn and scan of the numerous food stalls revealed the instigator as a bloke standing inside the VDCdW food van with a great big beaming smile on his fuzzy mug! It appears that David and the team had been anticipating the day that I would rock up, camera in hand, and were very keen to get some feedback on the burger. With all intentions to leave swiftly forgotten, we spent a good while chatting about burgers (and pizzas, with Warwick from the Wood-Fiery Redhead stall next door), David’s efforts to build up his food van in an increasingly competitive market, and that magic weapon they’ve unleashed upon an unsuspecting public, the hot sauce!! It’s understandable that you need to cater to your market, and in this case it unfortunately means turning down the spice-meter. My recommendation would be to have a bottle of the 100% strength under the counter and ask the customer whether they’d prefer their sauce ‘hellfire’ style! In the interests of obtaining some additional feedback, Dave also gave us the opportunity to try their spicy chicken wings. I have to be honest, if it was a choice between the burger and the wings, I’d have to go the wings! And believe me, that’s not because the burger is bad in anyway, it’s just because those chicken wings are so damn good!! Cooked to absolute perfection, the tender flesh was barely clinging to the bone. Starting out very mild, by the time we’d finished the four morsels our mouths were once again starting to sing! Again, not quite as hot as we would normally prefer, but when the flavours are this good you’ve got no right to complain! 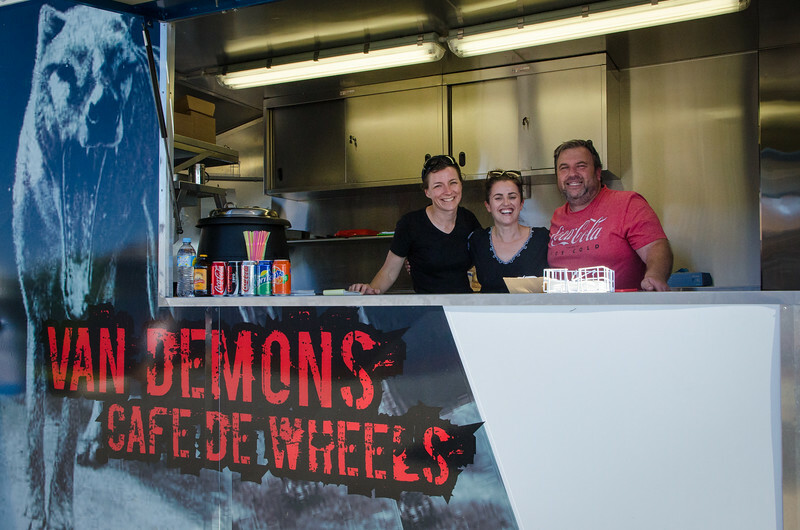 The team behind Van Demons Cafe de Wheels are a breath of fast food fresh air. It was so encouraging to realise that they were genuinely interested in our honest feedback, warts and all, and weren’t concerned in the slightest when I did make a couple of minor suggestions for improvement. It’s that desire to continually improve their product that I’m sure will stand them in good stead in the future. Not to mention the fact that their food tastes absobloodylutely incredible! !